Six years ago today, we lost my dear sister Patty to breast cancer. Patty has taught me more about Christianity than anyone else has in my entire life. 1 Praise the LORD. Praise the name of the LORD; praise him, you servants of the LORD, 2 you who minister in the house of the LORD, in the courts of the house of our God. 3 Praise the LORD, for the LORD is good; sing praise to his name, for that is pleasant. 4 For the LORD has chosen Jacob to be his own, Israel to be his treasured possession. 5 I know that the LORD is great, that our Lord is greater than all gods. 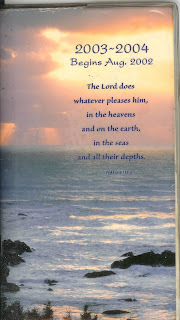 6 The LORD does whatever pleases him, in the heavens and on the earth, in the seas and all their depths. Yes, it is the same exact verse, Psalm 135:6. 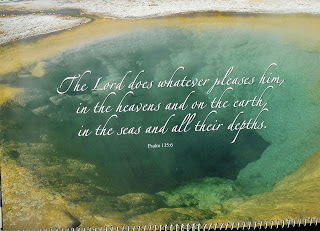 "The LORD does whatever pleases him, in the heavens and on the earth, in the seas and all their depths." I believe that this was God's (and Patty's) way of reassuring me that it really was His will to take Patty home to be with Him, and that He does do whatever pleases Him. 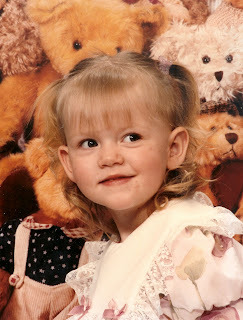 As much as we would have loved for her to be healed... as much faith as Patty and her family had in the fact that she would be completely healed...as much as she loved her parents and her nine siblings...as much as she loved her husband of 21+ years and her eleven children...she loved her Lord and Savior most of all. And I truly believe that God honored that. And even though she prayed to be healed, that the deepest desire of her heart was to be in heaven with HIM...where she is today. Remember, that whenever we pray, we say, "Lord, not MY will, but YOURS be done," but our will is not always His will. Last night was our monthly karaoke night at church. After everyone else had left, (at about 11:30pm), Ray and I and my 4 year old grandson, CJ were left alone in a mostly dark church, finishing the clean-up and loading all of our karaoke stuff back in the truck. I picked up a toy that belonged in the nursery, and asked CJ if he'd bring it in there. CJ (in his tough guy voice): "I'm not afraid of the dark, Grandma." But then a moment later he was back in the Youth room, still holding onto the toy. "I'm afraid of THIS dark!" he said. So, I told him that this was God's house, and there was nothing scary there...besides, God is bigger than the Boogie man and he wouldn't let anything happen to him. He agreed, and I went with him to put the toy away, as he said, "God and Grandma will protect me." Then he decided he needed a drink of water. We're walking through the dark hallway to the drinking fountain, (with CJ very bravely leading the way), and this is what he says, "Come on, Grandma...Come on, God!" He followed that up with, "God is walking with us", to which I wholeheartedly agreed...through my laughter. There is only ONE TRUTH. Your belief of what is TRUE, and my belief of what is TRUE could be vastly different from each other, but that does NOT change the fact that there is only one TRUTH. I have tried to explain this to several people in my life, and they usually don't get it. I'm not talking about opinions here...I'm talking about BELIEF. For instance...some people believe in life after death, and some don't. Does that mean that for those that do believe there is an afterlife, there will be...and that don't believe in life after death there won't be? Will they just disappear into absolute nothingness when they die? No. That would be absurd. Even if you do BELIEVE in some sort of life after death, you may not believe there is a heaven...or you may believe in heaven, but can't possibly believe a loving God would send anyone to hell. Our beliefs may also differ in the WAY to get to heaven, (or hell). I happen to believe that there is only ONE way to get to heaven. And no, I am NOT trying to shove my own beliefs down your throat...I'm simply trying to point out, that even though you may think I'm wrong, (and I could be), and I may believe that you're wrong, only one of us can be right. I just read a book by Larry Osborne, entitled: 10 Dumb Things Smart Christians Believe. Just because "everyone believes it" doesn't make it true. It was a great book. The author lays it all on the line here, and like the little boy in the story of "The Emperor's New Clothes", he's not afraid to bust the widely held myths and "urban legends" that surround Christian's beliefs these days. People don’t set out to build their faith upon myths and spiritual urban legends. of Scripture, loss of faith, anger toward both the church and God. I have also received not one, but TWO copies of this wonderful myth-busting book from Coast to Coast Publicity to GIVE AWAY to my readers! To enter, simply leave me a comment regarding one of the myths this book talks about, and make sure I have a valid e-mail for you, in the event that you are chosen as one of my lucky winners. This contest is open to all residents of the continental U.S. and will be open until May 2, 2009. I will post the winners here on my blog on May 3rd. Good Luck! I'm finding (a bit to my surprise), that I'm enjoying a bit of birdwatching these days. Not that I would necessarily go out on hikes and look for specific species or anything, but since we've moved out here in the country, where we are surrounded by trees and ponds, there seems to be an abundance of them right outside my window. 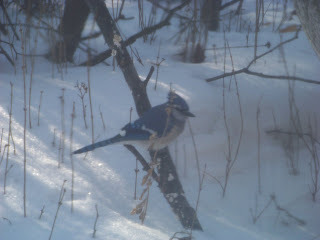 I've watched a few of these blue jays throughout the winter months, and have even been awakened twice by their tap-tap-tapping on my windowsill...the window happens to be situated smack dab in the middle of our headboard...so this is quite an effective alarm clock for me. This morning, I had a couple of new visitors, the bright red color of this cardinal caught the corner of my eye, while I was on facebook this morning. 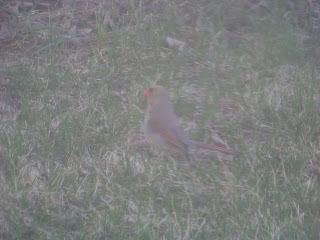 This picture is a little blurry because I think the camera was focusing on the window screen. He was very shortly joined by his wife. She is a little hard to see here, but I guess that's why God made the females so much less conspicuous than their mates...for their own protection. They were both posed "pretty as a picture" for a few minutes, right in front of my window...but alas, that is when my camera decided it needed fresh batteries!! 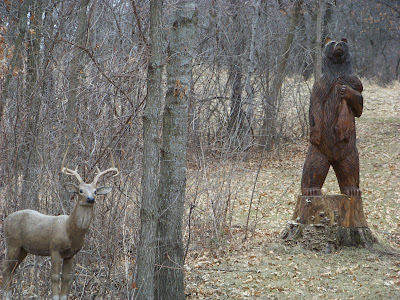 I did manage to get this one of the pair, (he is next to the tree, and she is in the foreground here), after replacing the batteries. 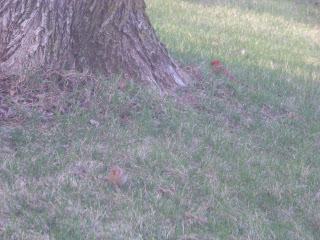 Right after that, he hopped behind the tree. I'm thinking that it might be fun to get a bird feeder to put right here outside my window, since they all seem to like to hang out here anyway. 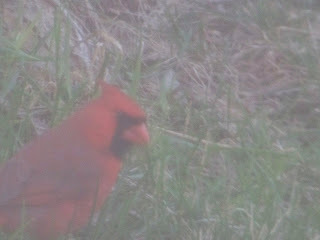 I'll also keep my camera nearby, to try to catch them...which is easier said than done...birds can be so "flighty." Just when I think I'm all focused in for the perfect picture...they jump to another branch or take off to the skies. I got together with some of my family last night because my brother-in-law from Phoenix was in MN for his grandma's funeral. It was the only chance I'd have to see him, since he is here for just a few days. Anyway...while we were waiting for Randy to arrive, two of my brothers, (who shall remain nameless, but it was not Bob ;) ), got on my case about my posting their pictures on THE INTERNET without their express written permission. Okay, they didn't exactly say "written" permission...but they were appalled by the fact that their sister would put their pictures out there for all the world to see. I have now removed the pictures of these two from facebook, there was only a couple of pics...so now, I guess I'll have to search my blog and see if I have any of them on here. I'm pretty sure there are some of them in some family group shots, sorry guys...they're staying put. I did upload a 22 second video of my brother Bob singing, to YouTube, (only because it goes faster than uploading it to Blogger), and put it on my blog...which is imported to facebook, if that's where you happen to be reading it. Bob pretended to be upset about that...but then said he didn't care. Neither of the other 2 brothers even know how to get ON the Internet, (and they don't even want to know), but have heard from other family members that I put them online. For the record, I don't generally put anyone's full name on anything on my blog, and the pictures I had on FB were in a private family group, that you have to have permission by me or one of my siblings to even join. They were not accessible to anyone other than other family members. Just so you know, the only reason I put pictures and or videos of them singing, is to show the world what good-looking, talented siblings I have! It's hard for me to believe I've been a blogger for an entire year now! Time flies when you're having fun, I guess. I started blogging mainly to document my weight loss journey, and figured I'd fill in with funny/bloggable moments that happen along the way. I have done that, but somewhere in the middle of everything, my blog became less about weight loss, and a little more about everything else going on in my life. 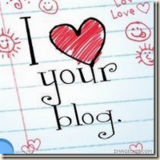 I've found that blogging is something I really enjoy doing...kind of a creative outlet for me. I can also look back to see what has all happened during the past year. I did that when I wrote my very first Christmas letter this past December. I've had these contests open for awhile now, and I'll leave them open until midnight tonight. You can find out more about each book by clicking on the pictures in my right-hand side bar. To enter, simply leave me a comment after the review of each book, or easier yet~ just leave me a comment after this post. Just let me know which book/books you'd like to be in the drawing for. (US residents only please.) Winners will be posted tomorrow. Thanks, and good luck! THE CUTE LITTLE DEAR DEER WITH THE BARE BEAR BEHIND! 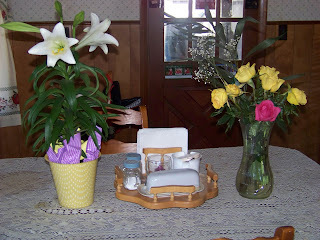 This is the beautiful Easter lily I got from Christian for Easter, and the roses that I received from my DH when I returned from our Duluth trip...well the yellow ones were from him...the pink one is from my DD, Molly! Shhhhh....don't tell anyone...but I think she actually missed me. 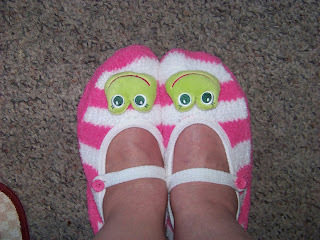 And believe it or not, Molly also begged her sister to buy these cute slippers for her to give to me as an Easter present too...(see, she DOES love her mom). Thanks, Molly, I love them!! 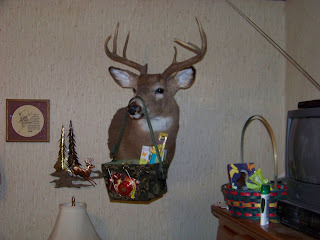 This may look like a very obvious place to find a camouflage Easter basket...but CJ was standing on our bed...looking at Grandpa's basket on his dresser...and looking right past his own basket that was hanging from "Buck's" nose. It must have been the camo! 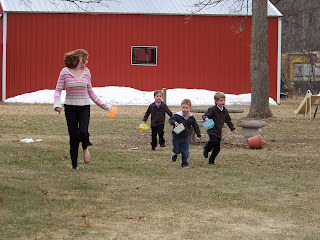 After finding Easter baskets, we headed to church for choir practice and a pancake breakfast put on by the youth group. We had a beautiful Resurrection Sunday service. Ray and I were in the choir, which was part of the largest musical ensemble we've ever had up on our stage at church. There were guitars, violin, flute...you name it...we even had a brass section! I wish I'd thought to bring my camera and take a picture of it. I couldn't really tell what it sounded like to the congregation, but I've heard it was pretty good. We also had more people attend than we have probably EVER had on a Sunday at our church!! 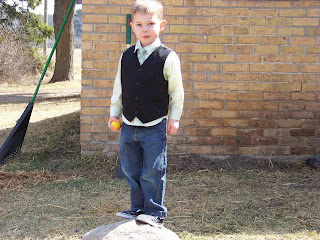 "On Christ the Solid Rock I Stand?" Yeah, that sounds good for Easter Sunday. Caught in mid-air...Good job, Jess! 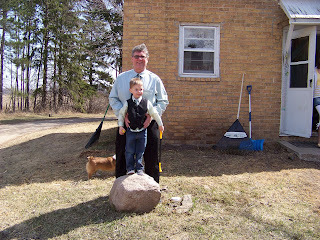 When we got home, we had to get a picture of Christian and Grandpa in their green Easter shirts. Bart, what are YOU doing in this picture...you're not wearing your green Easter shirt! Then we all got in the picture...except for Jessica, who was taking it, that is. Don't you love the implements of destruction in the background?? 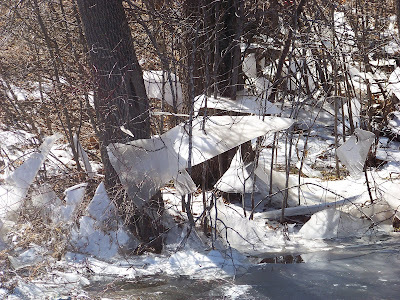 Can you tell it's Spring in Minnesota? We've got the rakes AND the snow shovel out...you never can tell which one you might need this week. After a light lunch of egg salad sandwiches and a nap, Ray needed to head to the airport, to pick up his daughter Sarah and her husband Brad. They were returning from Washington, DC. The rest of us, Jessica, Molly, CJ and I, hopped in Jessica's car and headed out to my parent's house for an Easter egg hunt and dinner with the family. Ray, Sarah and Brad joined us there, in time for dinner. 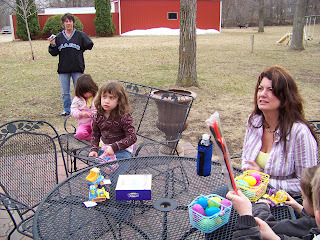 The start of the Easter egg hunt at my parents' house. 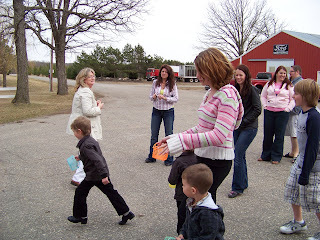 My sister, Laurie (farthest to the left here), organized the whole thing, and her daughter Rachel and son-in-law, Kurt hid 85 candy-filled eggs for the kids. Rachel and Kurt are in the upper right-hand corner of this pic. Thanks, guys! The kids quickly disappeared around the corner of the house, so I didn't get a real good picture. 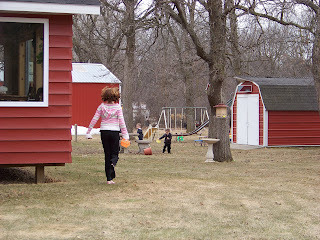 The older kids, Molly and her cousin Tanner, who are both 12, helped the little ones find eggs, and found a few for themselves, that were hidden in the less obvious places just for them. 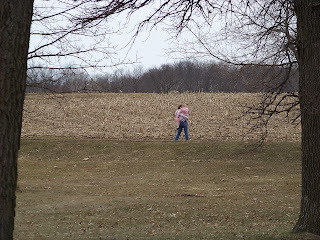 Little Shelby thought the Easter Bunny had really hidden them out a ways and ran as fast as she could out to the cornfield! Big sister, Lacy had to run after her and retrieve her. 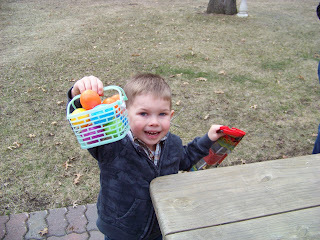 Here's CJ with his eggs all in one basket! 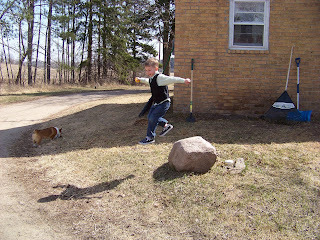 He won a prize for having found so many eggs, it's a kite he's holding in his other hand. This is my sister-in-law, Rose, her two little girls, Liz & Katie and my sister Kathy (and in the very corner) her two little boys, Tiegen and Grayson. The little girls got there a little late for the hunt...but were still able to find quite a few eggs. 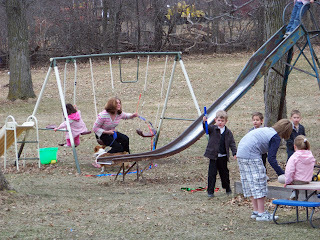 All the kids playing on G & G's playground. Then all seven of us, (Brad and Sarah, Molly, Jessica and CJ, and Ray and I), went home and went to bed after a very, very long day. I had recently purchased my first very own computer, and had my son Joel hook it all up for me. Since I wanted to find a good Christian man and didn't really want to get into the whole dating thing, (I just wanted to cut to the chase and find the one I was SUPPOSED to be with), I tried searching for "Christian Singles" and came across a website called: "MatchMaker ~ The Christian Connection." That looked like a good place to start. I entered all my statistics, set the settings to go out 100 miles from me and searched for a week or two. I contacted a couple of people that looked interesting, but one had already met someone and the other didn't want anything to do with someone who was divorced. Then one day, I decided to venture out a little farther and changed the setting to 150 miles. After looking for a little while, my daughter, Jessica came in the room and said, "Let me look, I'll find you someone, Mom." After just a few minutes, she said, "Hey Mom, this guy sings!" I said, "Move over and let me see that." I contacted him and he wrote back to me. Although he was planning to move to Bigfork at the time, it turned out he actually still lived right here in P-town... only about 30 miles away from me! 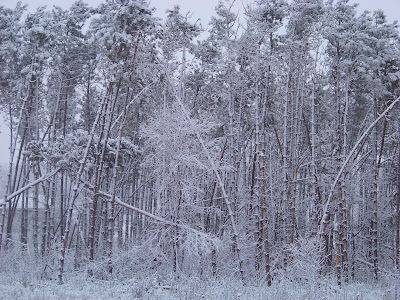 We exchanged e-mail addresses and a day or two later I found him on YIM. We chatted for a while and then I gave him my phone number and he called me. After two VERY long phone conversations over the next few days we set up our first date. We would go out to dinner on a Friday night--exactly 10 years ago, today. And yes, even though my older sister, Peggy warned me to drive separately, (you can never be too careful about people you meet on the Internet), I felt like I'd known him forever already, and decided to let him pick me up at my apt. I was very nervous about all this. It had been years since I'd actually dated. What should I wear? What will he be like? How will I know if he's "Mr. Right?" My sister, Patty told me I should "put out a fleece" like Gideon of the bible did. 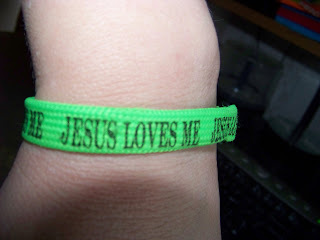 So, as I'm cleaning up my apartment, I look around and see this bright green bracelet on top of my refrigerator that says JESUS LOVES ME. I had gotten it from Molly's grandpa in a box of stuff he'd sent us while I was still with her dad. 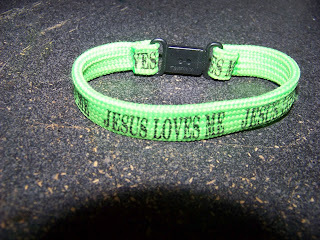 So I prayed, "God, if this is the right man for me, let him be wearing a bracelet just like that one." And then immediately thought, "Oops!, I'd better take that back. No grown man is going to be wearing one of those." And then I was thinking of all sorts of other things... like "Let him be wearing the same color shirt as me"... or "If he comes to my door with flowers, I'll know"...but I never really did come up with anything else to "put out there." Anyway, Ray arrived at my door with a single rose in his hand for me. Little Molly went running to the door with me, and after I answered it and shook his hand, I introduced her to him. She looked up at him with her big brown eyes, (and while curling her little ringlet curls at her neck with her finger), she said, "Hiiii...Raaayy." It was very cute...but a little embarrassing. I have no idea where she got that from and it's the only time she's ever done it (to my knowledge). Jessica was there to babysit Molly, so Ray and I went on our way. While we were dating, little Molly used to tell people this about us, "They love their 'chother." And after 10 years together, we still do. Remember, God IS the ultimate "MatchMaker"...Trust Him! The Treasure Principle: Unlocking The Secret of Joyful Giving ~ Book Review and Giveaway! They say that good things come in small packages. This is a very small, easy to read book that just may change your life. It's all about the concept of laying up your treasures in heaven...you know you can't take it with you, so as the author of The Treasure Principle tells us, you can send it on ahead! Who knew? I'm going to study this book further and share it with my husband. Perhaps the reason we are always broke is because we are not giving enough. Flip-Flop Your Concept of Giving! Bestselling author Randy Alcorn introduced readers to a revolution in material freedom and radical generosity with the release of the original The Treasure Principle in 2001. Now the revision to the compact, perennial bestseller includes a provocative new concluding chapter depicting God asking a believer questions about his stewardship over material resources. Readers are moved from the realms of thoughtful Bible exposition into the highly personal arena of everyday life. Because when Jesus told His followers to “lay up for yourselves treasures in heaven,” He intended that they discover an astounding secret: how joyful giving brings God maximum glory and His children maximum pleasure. Discover a joy more precious than gold! After years of writing and teaching on the theme “God owns everything,” in 1990 Randy Alcorn was sued by an abortion clinic (for peaceful, nonviolent intervention for the unborn). Suddenly he had to resign as a pastor and was restricted to making minimum wage. Legally unable to own anything, Randy gave all his book royalties to missions work and need-meeting ministries. He and his family have experienced the reality of The Treasure Principle—that God really does own everything, takes care of us, and graciously puts assets into our hands that we might have the joy and privilege of investing in what will last for eternity. Randy Alcorn is the founder and director of Eternal Perspective Ministries (EPM). 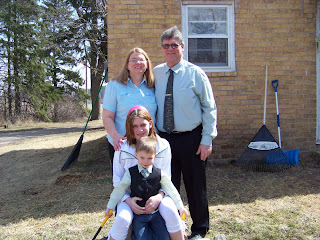 Prior to 1990, when he started EPM, he served as a pastor for fourteen years. He has spoken around the world and has taught on the adjunct faculties of Multnomah Bible College and Western Seminary in Portland, Oregon. Randy is the best-selling author of twenty-seven books (over three million in print), including the novels Deadline, Dominion, and Deception as well as Lord Foulgrin’s Letters, the Gold Medallion winner Safely Home, and Wait Until Then. To learn more about The Treasure Principle or to purchase your own copy, go to RandomHouse.com. They were also kind enough to give me an extra copy to give away. I'm going to add it to my other 2 book giveaways as part of my first "blogoversery" giveaway on April 18th, 2009. To be included in this random drawing, simply leave a comment after this post before then. This contest is open to all US residents. Come back eash day and leave another comment/entry. Sarah graciously agreed to be our driver for the weekend. She has the biggest vehicle, so that worked out well. Actually, her van is the exact make and model that mine is, but mine has not been running since shortly after the start of the year. 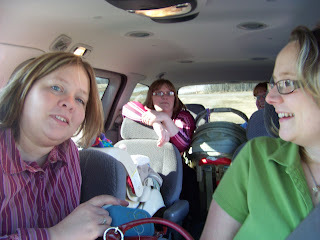 After she and baby C had picked up Anna, then Lisa and then me, we all headed over to Jody's to pick up her and baby K. Here we are in Jody's driveway, about to set out on our journey...with 5 ladies, 2 babies...and a bunch of stuff. 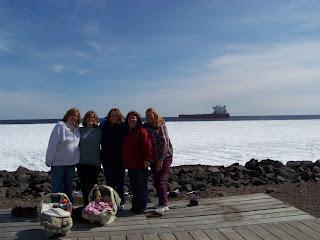 When we arrived in Duluth, we were hungry, so we stopped and ate at a Chinese buffet. The food was very good, but they must have been getting ready to close or something, they were almost out of everything...and they didn't seem to be restocking anything. Oh well, I probably didn't need to eat any more than I did anyway. 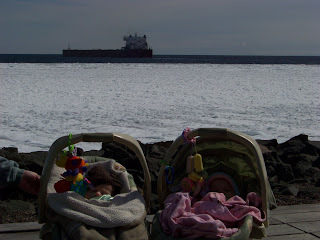 By the time we reached the hotel room, the babies were both fast asleep. They did a lot of that over the weekend, and I must say, they were both very good babies. 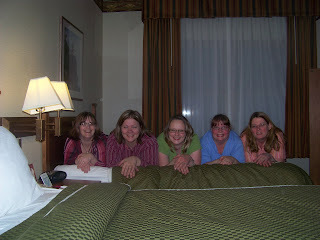 Shortly after we arrived, we decided to get a group picture, laying across one of the beds. I had the fun part. 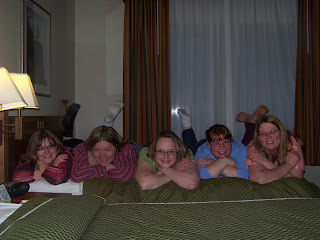 I set the timer on my camera, set it on a half-wall and had 10 seconds to run over and jump on the end of the bed and assume the pose that the rest of them were in already. Well, almost. I didn't hear the part about raising just my right foot here. There was one other one I took, that I was laughing really hard because I almost fell right off the bed. I won't post that one. Our hotel room was right on Lake Superior, with a very cool view. 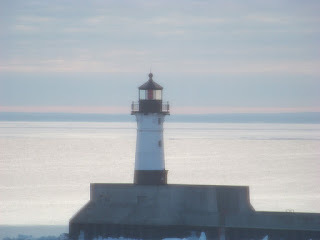 This is an old lighthouse we could see from our window. 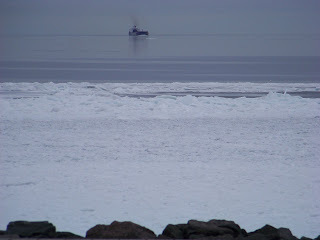 On Saturday evening, we looked out our window and saw something way off in the distance...could it be a ship? Yes, it was! We wondered how long it would take to get in. Anna called down to the desk and they said it should arrive in about 10 minutes. She, Jody, baby K and I all took a walk down to the pier to see it come in. 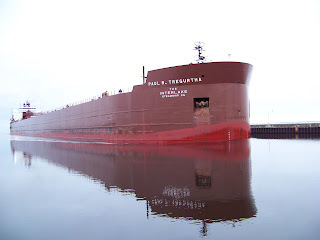 I got a video of the lift bridge going up, and then this one of the ship making it's way toward us. It was HUGE. 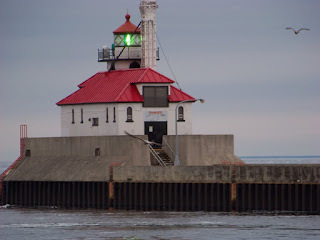 After the ship passed under the bridge, I turned around and got this picture of the lighthouse. There were seagulls flying all around so I waited until there were a couple of them in my viewfinder. I like the results...especially the gull that looks exactly like people draw them in pictures up there in the right hand corner. After we saw the ship come in we walked around to the front of the hotel, this picture was taken from the hotel's driveway. 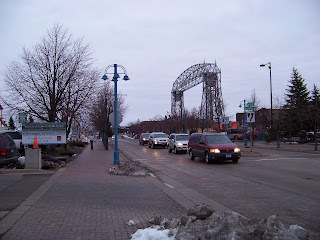 That's how close we were to the lift bridge. It was a very nice hotel too. I had to take this picture of two little ones...aren't they adorable?? The girls decided they need to do some slumber party/girly-girl things too. 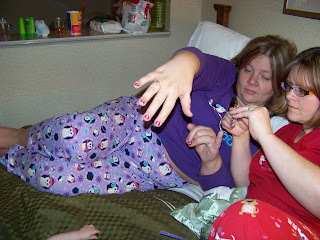 Here's Lisa applying some cute little butterfly decals to Anna's fingernails, while Sarah dyed her and Jody's hair in the bathroom. 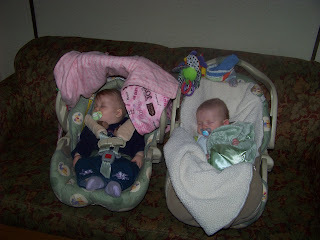 I was sort of babysitting the little ones during all this and enjoying every minute of it. After that they really got silly and a few of them thought it would be fun to have an old fashioned jumping-on-the-bed pillow fight! It did look like, fun but being the "token old lady", I decided I'd better behave myself and chose not to join in. Jody (Make a Joyful Noise), must have been really tired, because she and baby K slept through all the noise, and didn't participate either. I didn't get any pics of them, because I didn't want to leave baby Cole on the bed to go find my camera, but I'm pretty sure if you go to Lisa's (Our 7 QTPies), or Sarah's (Sassyfrazz) or Anna's (Moving Forward) sometime this week...you'll be able to see a picture of these silly girls. For some reason, about 10 minutes after they were finished with their pillow fighting...security showed up and the door and asked us to quiet down...I have NO IDEA why they would do that! LOL! After a fun-filled weekend, and cleaning up our very messy hotel room, (can you imagine what the bathroom looked like after 5 women were using it for 2 days?) we checked out, packed up the van and walked down to the shore to get another group shot. There just happened to be another ship leaving at that time. A very nice gentlemen offered to take the picture of us...so I agreed and gave him my camera. Little did he know that 3 other women were going to hand him their cameras too! He said he didn't know what he was getting into when he offered...but he was a good sport and took a picture with each of our 4 cameras! 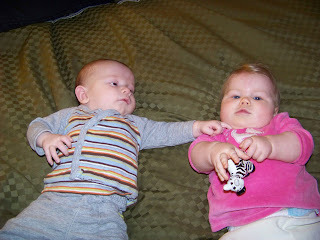 Here's one last picture of the babies on their "first date". Who knows, this could be a budding romance... And if they end up married to each other some day, they may just want to go back up to Duluth for their honeymoon. We had a wonderful weekend, and I want to thank all my buddies for inviting me. Also, thanks to Jody and her husband Dan for allowing us to use his hotel points for a free 2 night hotel stay. Many thanks to Sarah too for driving us all up there in her van. We'll have to do it again sometime! Clutter-Free Christianity: What God Really Desires for You ~ A Book Review and Giveaway! Clutter has been a part of my life for as long as I can remember. I grew up in a home with 9 siblings and a mother who worked full time ever since I started school. It was just something I learned to live with. Don't get me wrong, (especially Mom if you're reading this), our house was never really filthy, it was just hard to avoid that "lived in" look with that many people living under one roof. As a wife and mother myself, I've had a constant struggle with clutter all my life too...and that was true even before I met my husband Ray, who is the King of clutter, and brings home every stray item he finds, just to give it a home...or because he MIGHT need it some day. Anyway, in "Clutter-Free Christianity", Dr. Jeffress is talking about a whole different kind of clutter. He shows us how to cut through the clutter of everything we may have heard about being a Christian and get back to the basics of what God really expects and wants from us. I'm finding this book truly fascinating. For instance, he tells us that a "kingdom" simply implies the territory that is ruled over by a particular monarch. Therefore, the "Kingdom of God" not only refers to heaven, or some future time when there will be a new heaven and a new earth, but that the Kingdom of God exists right here and now and means "any place where God's will is being obeyed." That was a real eye-opener for me. When did the Christian life become so complicated? Your greatest desire is to please God, but with each passing week, your spiritual to-do list grows longer. As you strive to fulfill a never-ending inventory of requirements for being a godly parent, spouse, voter, employee, and more, you feel increasingly disconnected from the God you’re trying to serve. It’s time to cut through the clutter and get to the heart of what it means to please God. In this liberating look at the core principles of faith, Dr. Robert Jeffress reveals the truth about what God really wants from you–and what He wants to do for you. Through solid biblical teaching and practical insights, Dr. Jeffress points you toward a revitalized faith centered on becoming more like Jesus in action, attitude, and affection. You’ll learn how to partner with God in the process of spiritual transformation as you choose to follow Christ in forgiveness, obedience, trust, contentment, service, and prayer. Through a renewed focus on experiencing the kingdom of God right now, you’ll find your to-do list shrinking and your spiritual life deepening. It all comes with embracing Clutter-Free Christianity.Includes a Bible study guide for personal growth and group discussion. Clutter-Free Christianity would make a great bible study for small groups too, since it includes a bible study guide section in the back of the book. The book is available from Random House Books for just $13.99. I am also going to GIVE AWAY a copy of this excellent book. To get your name into the random drawing for this book, just leave a comment after this post. You can come back and leave a comment each day for more chances to win, just remember to leave me a valid e-mail address, so that I can contact you in the event that you are chosen as the winner. This contest is open to all residents of the continental U.S. A winner will be randomly drawn on April 18, 2009. Thanks! and Good Luck! Dr. Robert Jeffress is the senior pastor of First Baptist Dallas, one of the most historic churches in the Southern Baptist Convention. The author of sixteen books, he is a graduate of Dallas Theological Seminary and Southwest Baptist Theological Seminary. In addition, live broadcasts of Dr. Jeffress’ weekly messages reach millions of listeners and viewers each week, while his daily sermon series airs on 1,100 television stations and cable systems nationwide. Dr. Jeffress and his wife, Amy, are the parents of two adult daughters. Okay, I told you all I'd update you with my weight-loss progress on Thursdays. Well, there really hasn't been any significant progress in this area. It is now after April 1st and I've been on this current weight loss journey for exactly one year. When I started out, I had sincerely hoped to get to my goal weight by that time...I still have a long "weigh" to go. On top of all that, I'm pretty sure the universe is against me. Not only has my treadmill quit working, and we seem to be stuck in a never-ending Winter season here in MN...but now my electronic scale died!! Maybe it just needs a new battery, but I just replaced it. Perhaps the one I replaced it with was also dead? 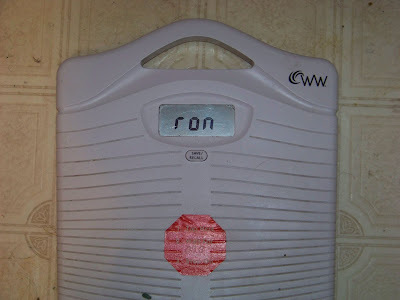 I don't know, but for the last two weeks, my weight on that scale has read: ron. I have NO idea what that means. I'm not giving up, and as I've said before, I'm happy to still be 35 lbs or so lighter than I was a year ago...but I'll resume with the "Think Thin Thursday thing as soon as I get my scale fixed. I do have an old fashioned scale, that weighs about 5 lbs less than the electronic one...but at least it will let me know if I'm gaining or losing...for my own information. I'm hanging in there. 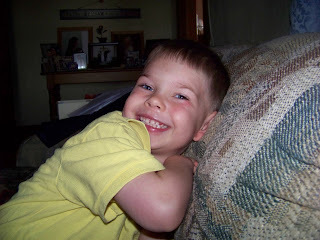 Wordless Wednesday #25 ~ No, Your Eyes are Not FOOLING you! Do, do, do...looking out my backdoor...on April 1st!